Rapidly establishes. Very drought tolerant. White delicate cottontop seedheads offer beautiful display in mass plantings. 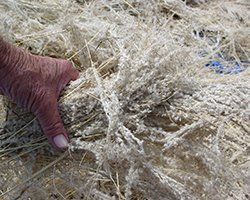 Arizona Cottontop is grazed by cattle, horses, and sometimes by sheep and goats. It is most palatable when green. It cures well on the stem and provides dry forage for cattle. This species has beneficial qualities in terms of diet for wildlife species including pronghorn antelope, mule deer, desert cottontail, whitethroat woodrat, javalina, and scaled quail.